Pad Thai is an ever popular dish and if you are a noodle lover like me then you will also like Pad See Ew. The noodles are flat and fat rather like tagliatelle. 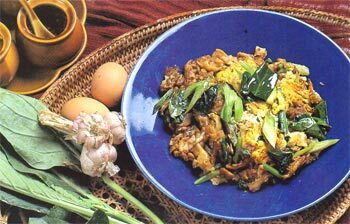 Stir fried in a wok, with black soy sauce, some vegetables and the meat of your choice. Serve hot with small condiment bowls of ground dried red chilies, sliced green chilies in white vinegar and white sugar. Absolutely delicious! If you love noodles, love Pad Thai, you will definately love this!